Rotary is dedicated to fighting and preventing disease. 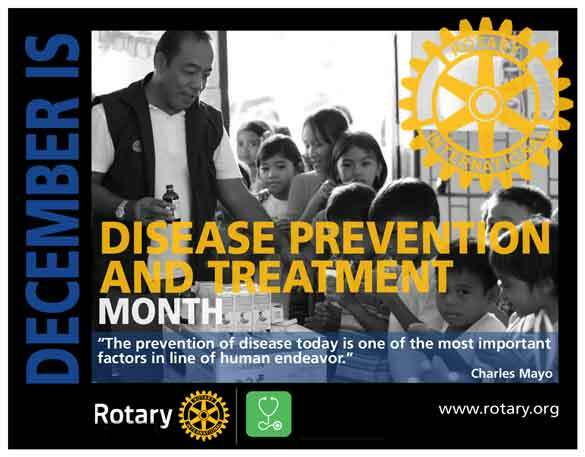 Disease Prevention and Treatment is one of Rotary’s Six Area of Focus. Disease and illness results in pain and injury. Prolonged severe illness may result in loss of employment and income. It affects families. It affects quality of life. Rotary and Rotarians are committed to helping people to live healthy lives. Our signature project in this area is Polio Eradication. But polio is not the only disease or aspect of healthy living on which Rotarians have expended energies.